I got into Warsaw right about on time, and immediately headed for the airport bathroom. I was supposed to be interviewed as soon as I got out into the arrivals hall, and I had been traveling overnight and with very little sleep. (Thank you, Mr. Middle Seat, for elbowing me every.single.hour. to either ask me a question I didn’t know about Amsterdam Schiphol Airport or ask me to get up so you could go walk the aisles. Next time, book early, and book an aisle!) 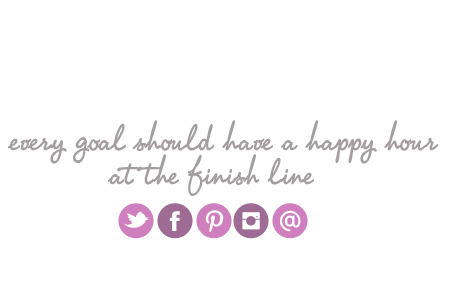 In short, I looked like a mess – and I need to fix it! 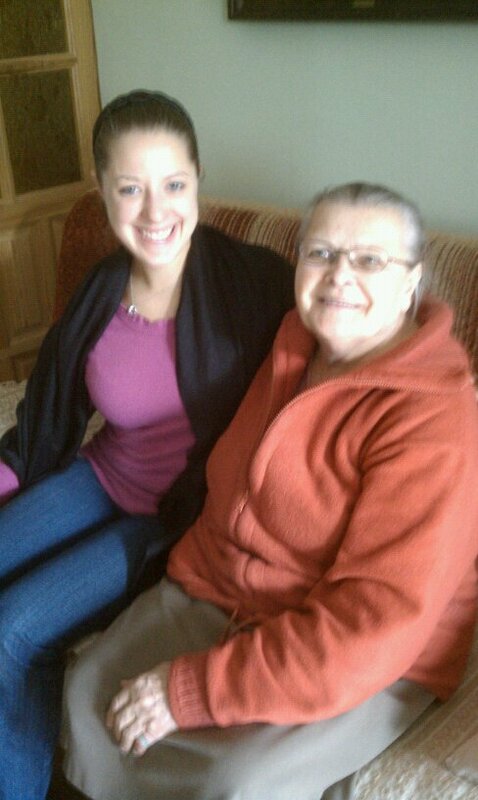 We headed for my Babcie (grandmother)’s house, and I was thrilled to see her! 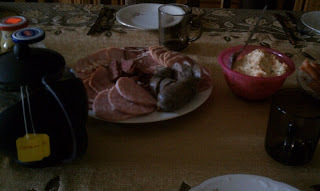 Given the high calorie foods that are provided while I’m here, and the fact that I always get trotted around from house to house so everyone can see me (and a full meal is provided at each), is it any wonder that my brothers and I always return to the states having gained about 5 pounds? I would also like to point out that pretty much the one English phrase my grandmother has learned is “stomach no hungry,” because we tell her that as often as we can to try to catch a break (usually with limited success). 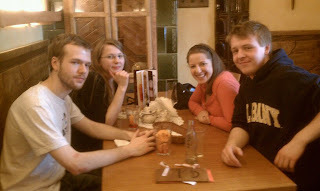 The language barrier also proved difficult in dinnertime conversation, but there I was saved by what gets me into trouble every time I go to Poland: vodka. Specifically, home brewed fruit vodka that my Ciocia (Aunt) Ewa says “will make you feel like heaven after four.” Well, it may be four for them, but for me it’s more like one. 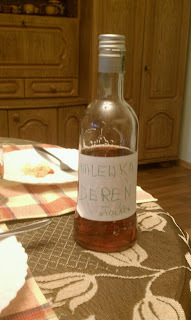 While my Uncle Pawo may claim that Poles can drink more alcohol than any other race in the world (he swears that there is scientific evidence of Poles surviving with ridiculous blood-alcohol levels), I am not nearly as practiced as the rest of my family. (And that includes my 6 year old second cousins). It was late before I got to bed – not good at all when I had barely slept the night before on the plane. Morning came all too soon, and I fell asleep in the car on the way to the velodrome. Not an auspicious start to the day! 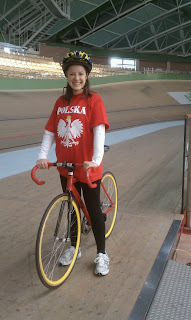 I suited up in the “Polska” shirt that had been given to me as a gift for the occasion, and headed into the velodrome. Bikers were already whizzing around the track at extremely fast speeds, and I was nervous – particularly as I was warned that these bikes had no brakes. The only way to stop was to gradually slow down, and then hop off onto the ground – a bit different than normal bike riding. Still, I was game! The famous coach who would be teaching me spoke only Polish, and I expected my dad to translate for me… but after the instructions were given, my Dad took off! Meanwhile, the coach was helping me onto the bike and encouraging me to go, so I did. I circled the track on the bottom level first, which was mostly flat. The ends of the ellipse were pretty scary-looking – the further to the outside of the course you stayed, the higher and steeper it got, so it was almost vertical at some points! I was fine just biking around the flat part and trying to get my bearings. The professional bikers were way above me, going at insane speeds, and I hoped they wouldn’t topple over onto me down below. But I got over it and kept biking – even venturing up the edge of the track at points. From then on, my dad stayed with me and made sure to translate the instructions – such as the one to pick up speed so you don’t topple over. I managed to avoid falling again, but one of my cousins didn’t have the requisite speed on a turn and his bike slipped. 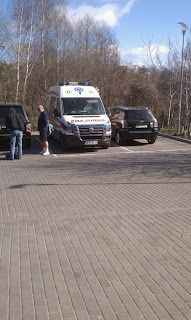 When we eventually left, the coach pointed out one more thing for my dad to translate: the ambulance parked outside the arena. Apparently it is there on a permanent basis, and is fully staffed whenever practices are in session. Velodrome racing is dangerous, yo! The rest of the day was spent getting in more exercise by traipsing around the beautiful Old Town of Warsaw with some family friends. 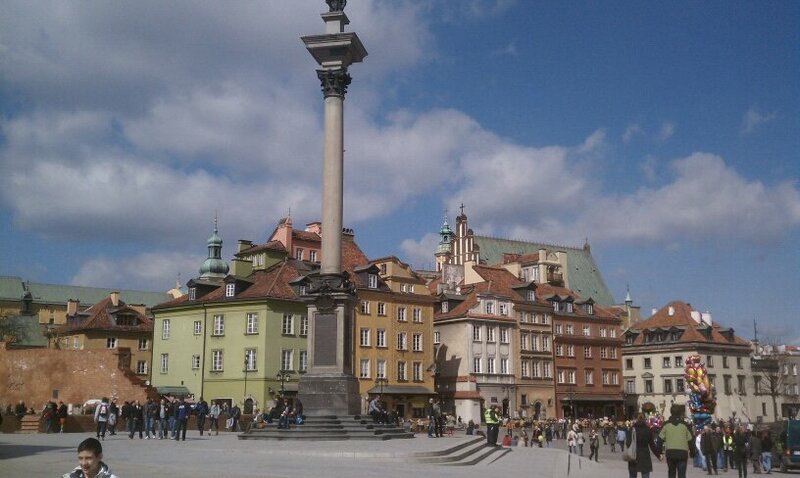 I think Warsaw is one of the prettiest cities in Europe, and it was a beautiful 60 degree sunny day to walk around! While I had been to Old Town before, we did check out one place that was new to me: the library at the University of Warsaw. The top of it is made out of greenhouse-style glass, and there is a structure built over the top of the glass so you can walk over the roof and look right down into the stacks! Cool. 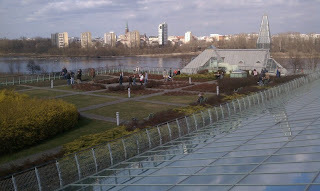 And there is also a gorgeous rooftop garden on the non-glass part, which looked to be a beautiful place to study and admire the view of the Wisla River. I had never seen anything like this, architecturally, and I loved it. If you are ever in Warsaw, be sure to check it out. 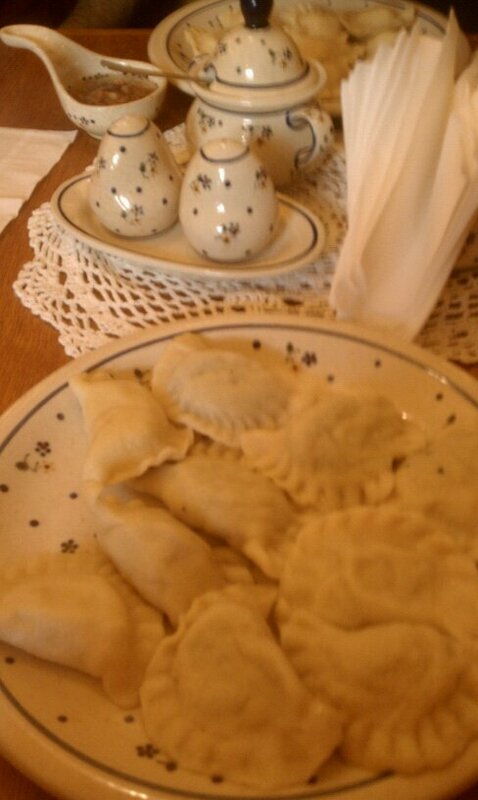 Of course, after all that biking and then 4 hours of walking, it was time to treat myself… to a pile of pierogis in this adorable homestyle restaurant, where the servers all wore traditional costumes. Now, I’m back at the Warsaw Airport and getting ready for my flight to Paris! After a wonderful weekend of family visits, I cannot believe I am topping it off with this little side trip. I have wanted to visit Paris since I was 10 years old, and while this is just an overnight layover for about 16 hours), it is still a dream come true. I am staying with my friend Heloise and I think our plan is just to get crepes and drink wine (fabulous! ), so the sightseeing will have to wait for another trip. But still… Paris, here I come!!! Looks like you had an awesome weekend! Sorry you crashed in the velodrome though, but at least you didn’t end up in the ambulance! 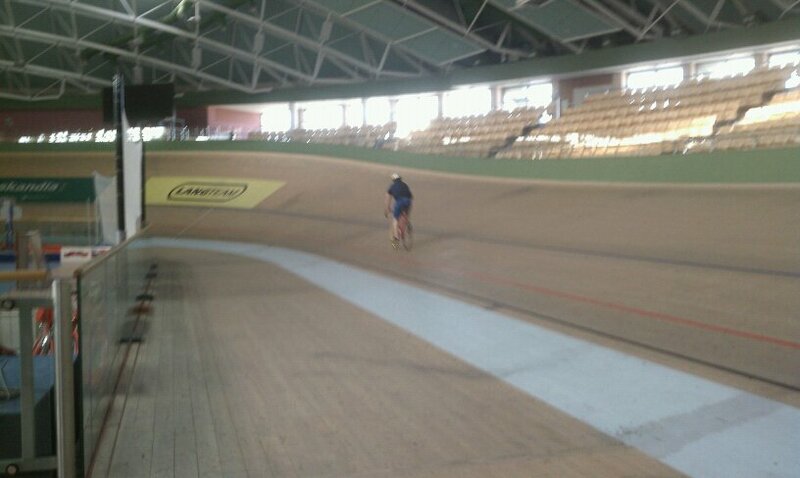 you have no idea how jealous I am that you got to ride around in that velodrome! 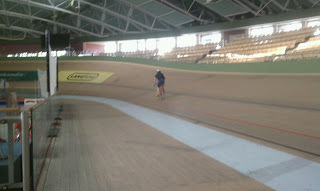 I ride a track bike here in the city and they are my fav! no brakes ma! I don’t know how you do it, traveling all the time! Wow! Velodrome racing. So jealous. In the US it is normally passing on the left. Funny the difference. I totally would have done the same thing. Have I mentioned that I want to be you when I grow up? Even though I’m 39 and supposedly grown up, I still want to be you when I grow up? 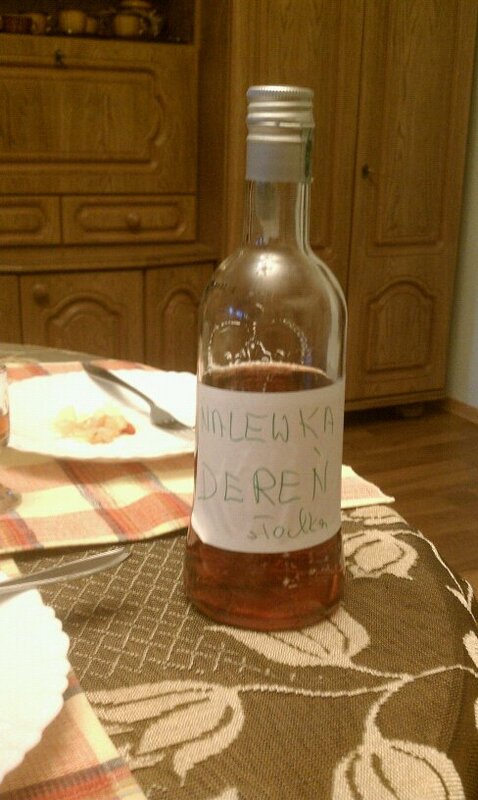 Wow, I had no idea you have family in Poland. My dad was born in Poland, so from one polack to another dobrze jest znać i Cieszymy się, że dobrze. Sounds like a great time with the family and some hearty eats! Sorry about the icky plane ride…I hate when that happens! The Velodrome sounds absolutely terrifying. Good thing you didn’t see the ambulance until afterwards. I would veto that on the next trip!